May Day or International Workers Day? Taking the U-Bahn, this time on the U2 just pulling into Alexanderplatz and I notice a news article on the train’s TV screen. Today is ‘Tag der Arbeit’ (International Workers Day) and the DGB (The German Trade Union Organisation) are holding marches to commemorate this fact. In Great Britain however, you would probably see pictures of people dancing around a maypole and celebrating with the May Queen in a far more rural affair. So why the difference between Britain and Germany? Well, it began over a century ago when the American Federation of Labour adopted a historic resolution which asserted that “eight hours shall constitute a legal day’s labour from and after May 1st, 1886″. International Workers Day is widely seen as the commemoration of the 1886 Haymarket Massacre in Chicago, where numerous workers and police died in a riot, and the first Workers Day was set in 1890 as an act of solidarity for the victims. 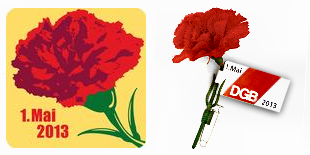 In Germany, it ironically first became a national holiday under the Nazi regime in 1933 and the emblem for the day is a red carnation. In Britain Workers Day is virtually ignored. Old pagan traditions die hard and May Day descends from pre-Christian times, as the festival of Flora, the Roman goddess of flowers (May Queen). The only tenuous connection with workers day in Great Britain was due to the reform of the catholic calendar with May 1st being the Feast of St Joseph the Worker, the patron saint of workers. In rural areas seeding was completed by this date and it was convenient to give farm labourers a day off. But the most significant of the traditions on this day has always been the festivities of the maypole around which traditional dancers circle with ribbons. This also incidentally happens in the Baden, Bavarian, and Swabian regions of Germany and maypoles are decorated with either flowers or emblems of the local trade. So be it Workers Day or May Day on May 1st, the emblems that seem to be consistent between Germany and Great Britain are either the maypoles or the flowers.